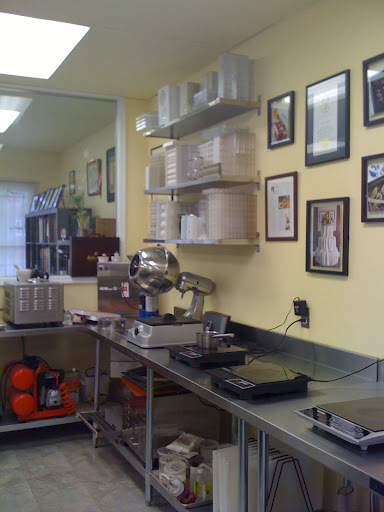 This year for my birthday I decided to do something special for myself – to take a class in chocolate-making! I think the term “chocolate making” is a little deceptive. If you are in the chocolate industry to ‘make’ chocolate is to take it from the plant, extract the bean, roast, pulverize and blend. However, in this class we took already ‘made’ chocolate and coaxed it into the more traditional forms of truffles and mendiants. 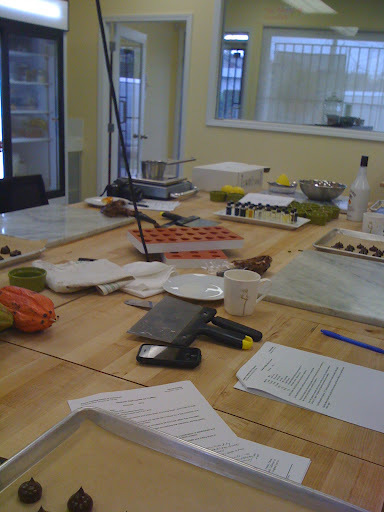 I actually took a vacation day from work to take this all-day class: 6 hours of stirring, marbling, piping, dipping and tasting chocolate from cocoa butter to 80%. In other words – it was a truly magical day. 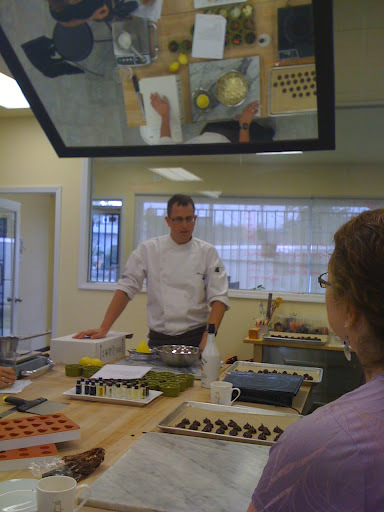 I feel like I learned so much – not only about HOW to make chocolate but the science and sense of making chocolate. We spent a significant amount of time smelling different ‘scents’ found in chocolate and tasting different kinds of chocolate (single origin and blended) and that process made me appreciate the quality chocolate I have had the pleasure of eating in the past. And how complex! Wow, how complex… I really had no idea chocolate had so many subtle layers, tones and notes. Kind of like coffee – I suppose. It was amazing how the ORIGIN of the bean would affect the flavor of the coffee! My favourite? Peruvian and Ecuadorian – the ones we tried had more distinct floral and sweet flavour, even though both were equally ‘dark’ chocolate. 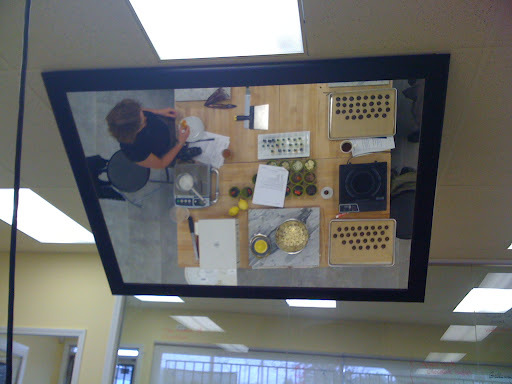 A picture of the mirror above chef Marco. If you can see those green ramekins in the reflection, we got to taste ALL of those chocolates! Yes, we worked hard. Very hard. A couple of snapshots of our work area. Under our Boos counter? Beautiful Kitchen Aid Pro 6s ready to be put into action! Yum! A chocolate ‘tumbler’ and a line of induction stovetops for heating up our saucepans to melt chocolate (a la double boiler) and also the heat up cream for the ganache. They worked SO well – I am almost tempted to shell out the dough for a stovetop. Seriously – the induction stovetop works with the magnetic element in cookware to heat up the vessel – so much of the residual heat is eliminated, as well as any messy scalded-on foodstuffs. It heated up the cream and water SO fast – I can see why they are used in candy making! Chef Marco Ropke speaking to the troops and dispensing his wisdom! I have to say, if there was one major reason for me to take another class, it would be because of him. Chef Marco was professional, helpful, funny, and a terrific teacher – I highly recommend being under his tutelage! (above) Marbled-whipped and piped dark chocolate ganache. These would later be dipped in tempered chocolate and rolled in cocoa powder. 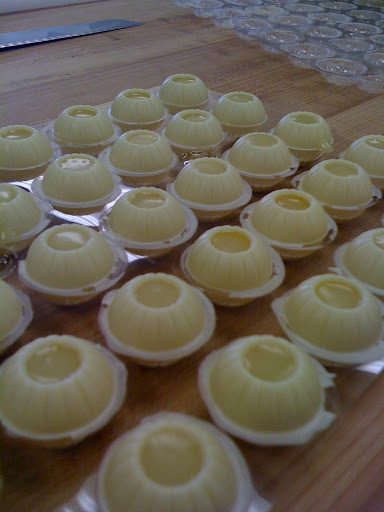 (below) Lime & coconut white chocolate ganache is piped into premade truffle shells (my god! no one told me these existed!). Unfortunately we didn’t have time to finish them (closing off the top & another coat of white chocolate) but no matter – they were still delicious! I was blessed and cursed to be the odd person out in the 7-person class. I didn’t have to work with a buddy which meant double the work – but double the goodies to take home! And take home I did! Two chocolates seen above, I did not document – the hazelnut nougatine and chocolate mendiants. The nougatine was divine – a whipped milk chocolate ganache with crunched up caramelized hazelnuts dipped in tempered dark chocolate and rolled in icing sugar. Amazing. The ganache was fluffy and soft and the caramelized nuts added a depth of texture and flavor that was mind-blowing. I will definitely be making those again! The dark chocolate mendiants are tempered chocolate piped into molds and topped with nuts and dried fruit. So simple, yet so delicious. 1) Quality of chocolate COUNTS. One prime example of this are the chocolate mendiants. By themselves, they are a very simple confection. Tempered chocolates piped into molds and studded with fruits and nuts. But the usage of high grade dark chocolate works with the toppings to create a layered and lush experience that cannot be replicated with generic store-bought chocolate. The break of the chocolate is crisp – it doesn’t melt into your hands and the flavour is savored not only with your tongue, but your nose and throat – the scent and texture of the chocolate create an experience that is unlike any other. 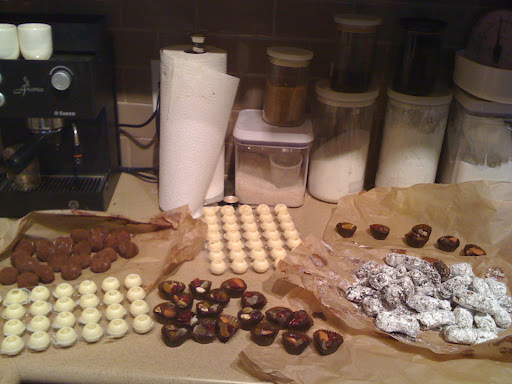 2) Making chocolate is damn hard. My biceps HURT the next day. Fold chocolate over and over on a marble slab is hard work. Stirring to melt chocolate is hard work. Whipping chocolate is hard work. Dipping and rolling chocolate is hard work. Making chocolate is hard work. I would love to take more classes in the future – and luckily they are starting a batch of evening classes to accomodate those who work full-time – now to start saving up! There is something to be said about actually taking a hands-on class like this. Yes, it is expensive; yes it is labour intensive – but there are tips & tricks conveyed here that you cannot get through a cookbook or TV show. We stuck our hands IN the chocolate (and yes, it was amazing) to feel the temperature of chocolate. We let pure cocoa butter crumble in our mouths. 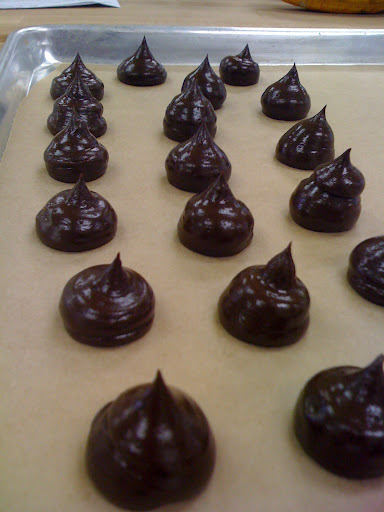 We watched our ganaches split (not mine, tee hee) and worked hard to bring them back to life again. These are the real lessons learned in the class – not just how to follow a recipe. Thank you Marco & the Vancouver Pastry School!